As you’ve no doubt heard, Devin Nunes and Paul Ryan continue to extort DOJ, ostensibly to find evidence of FISA abuse, but by all appearances, to review intelligence on behest of Trump, delegitimize the Mueller investigation, and create some excuse to start impeaching the people overseeing it. A Chuck Ross article on the latest effort ends with a reference to Stefan Halper, a dual US-UK citizen who was a Cambridge professor in 2016. TheDCNF reported that in Sept. 2016, he was approached out of the blue by Stefan Halper, a University of Cambridge professor and former U.S. government official. Other right wing sites appear sure that Halper is the source in question. In 2016, Halper resigned from the Cambridge Intelligence Seminar along with Richard Dearlove (Christopher Steele’s old boss) out of concerns Russia had started funding it, which is to say he has close ties with a lot of the spooks that the Republicans are obsessed by. Halper would fit as an American. And as someone at the overlap between MI6, the FBI, and CIA, any information he discovered would ultimately get shared with Mueller. When Ross first broke the story of weird meetings between Halper and Trump aides in March (a month before Nunes made the mysterious request), he provided very specific descriptions of when Halper spoke with each of three campaign officials (though he kept the identity of the third secret). Halper first met Carter Page at conference on July 11 and 12 in London (the meeting would have been on the way back from his trip to Moscow), then remained in contact thereafter. Halper met campaign foreign policy adviser Carter Page at a July 2016 symposium held at Cambridge regarding the upcoming election, Page told TheDCNF. The pair remained in contact for several months. Halper met with the third, unnamed campaign advisor on August 31 or September 1, though did not mention Papadopoulos at the meeting. Halper also requested and attended a one-on-one meeting with another senior campaign official, TheDCNF learned. That meeting was held a day or two before Halper reached out to Papadopoulos. Halper offered to help the campaign but did not bring up Papadopoulos, even though he would reach out to the campaign aide a day or two later. Halper first reached out to George Papadopoulos on September 2, then met with him over several days in London in mid-September. Papadopoulos and Halper met several times during the London trip, including at the Connaught Hotel and the Travellers Club — a classic 19th century club foreign diplomats and politicians frequent. Halper’s research assistant — a Turkish woman named Azra Turk — also met with Papadopoulos. The Connaught Hotel meeting was scheduled for Sept. 13, 2016, and the Travellers Club conclave was two days later. While discussing the policy paper Papadopoulos was to write, Halper made an out-of-left-field reference to Russians and hacked emails, according to a source with direct knowledge of Papadopoulos’s version of events. Halper is a close associate of Sir Richard Dearlove — the former MI6 chief. In December 2016, Halper, Dearlove and espionage historian Peter Morland made international news when they announced they were leaving an organization called the Cambridge Intelligence Seminar due to concerns Russian operatives had infiltrated the group. Months earlier, in early fall 2016, Dearlove reportedly met with dossier author Steele. Steele sought out Dearlove’s advice on how to proceed with information he gathered on Trump’s ties to Russia, The Washington Post reported. Former MI6 Moscow station chief Steele had been told Trump campaign members were colluding with Kremlin operatives to release emails stolen from the DNC. Steele’s dossier does not mention Papadopoulos, though the former spy was made aware of the Trump campaign aide while he was working on his anti-Trump document. FBI agents asked Steele during an October 2016 meeting in Rome if he was aware of Papadopoulos. Steele did not have information on Papadopoulos, the former spy said. But Papadopoulos does have at least one possible connection to the dossier. During the campaign, Sergei Millian approached him. Millian is a Belarus-born businessman who was allegedly an unwitting source for some of the most salacious claims in the dossier. While it’s possible Halper got wind of the counterintelligence concerns via intelligence sources in London, it doesn’t make sense that his information came via the dossier. The first dated report on Page is in a report submitted July 19, after Page had already made his trip to Russia (and stopped by London where he met Halper). Both of the sources on the report are Russian, not American or British, so not Halper himself. And the report was reported contemporaneously, meaning Halper wouldn’t have been the only outside source that could have told Steele about the trip, nor would Halper have needed Steele’s sources to learn about it. So if Halper sought out Page out of counterintelligence concerns, it likely had as much to do with the concerns FBI had in March 2016 (the ones that never appeared in the dossier) as it does July trip, much less any discussions between Steele and Halper about that trip. And if Halper is as spooked up as Republicans want to suggest, by the time of his subsequent communications with Page, he would have known of both those concerns. Similarly, the timing on the ties between Sergei Millian and Papadopoulos wouldn’t support a tie between Halper’s interest in him and the dossier. The Steele reports believed to tie to Millian date to June (including, possibly, the pee tape) and July. But July is around when Papadopoulos and Millian first met (I suspect, on July 22). So to the extent Millian really was a source for Steele, it would have largely preceded the time he met, much less became close with, Papadopoulos. But all that happened around the time the Australians informed the US of Papadopoulos’ drunken May ramblings. So by the time Halper met with Papadopoulos (and met the other aide, possibly as background to the Papadopoulos meeting), the US would have already had official notice of Papadopoulos via the Australians. 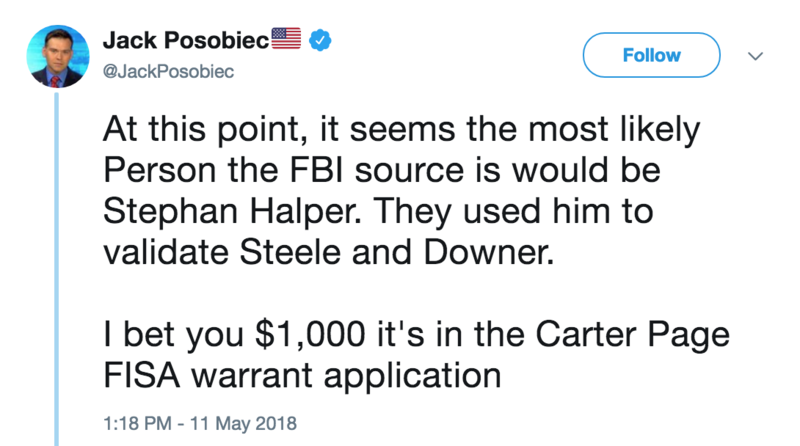 If anything, it’d be far more likely that Halper gave the US soft notice of the Downer meeting before the Australians did so formally than that Halper learned of Papadopoulos via some Steele channel. 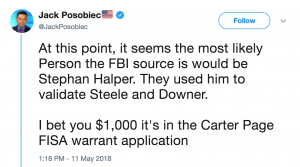 Admittedly, some nut jobs are wailing about Halper totally independent of the Steele dossier, because they’re outraged, apparently, that the the US sought to chase down whether the unvetted people with troubling ties to suspected Russian spies working for Trump for free were real concerns or not. I’ll return to that in a follow-up. But as background to laying out precisely how ridiculous the Republicans are getting here, understand that it is unlikely whatever investigation, if any, Halper was conducting was based off the Steele dossier. Update: Ross has taken issue with my claim that he ties Halper to the dossier. I base that claim not just on Twitter exchanges with his readers who make the allegation but on these details (for example, this one that claims Papadopoulos was a source for Millian before they met and that May and September are the same time). Ross introduces the dossier by claiming Page was a central figure in HPSCI’s investigation because of allegations made against him in the dossier, though the reality is that it’s because the dossier was included in his FISA applications. Page is also a prominent figure in the investigation due to allegations made against him in the infamous Steele dossier. Page’s trip to Moscow in early July 2016 is a central piece of the dossier. Christopher Steele, the author of the Democrat-funded report, alleges Page met secretly with two Kremlin insiders as part of the Trump campaign’s collusion effort. Page attended the Cambridge event Halper set up, four days after that trip to Moscow. Then there’s the insinuation, in the passage cited above, that because Halper took an anti-Russian stance with Dearlove in December and Dearlove had a tie to the Steele dossier in September, there must be some continuity between the two events. Ross could have avoided any mention of the dossier by simply saying that Halper and Dearlove took that anti-Russian stance together, but he didn’t. Finally, there’s the bizarre effort (noted above) to tie Papadopoulos to the dossier via Millian. I’m glad Ross has now made clear he did not intend to suggest a tie between Halper and the dossier, because (as I think I show here) they make no sense. I do hope his readers who do suggest there’s a tie understand he has disavowed any such suggestion. My goal with this post (as I suggest above) is to lay groundwork showing that the GOP basis for delegitimizing the investigation — that it purportedly started from oppo research paid for by Democrats — does not have a tie to the next stage, Halper. It seems whatever Ross wrote months ago, he and I are now in agreement that it does not have such a tie. Update: Ross is still cranky that I suggested his six references to the dossier in a story that’s not about the dossier hasn’t led anyone to imagine a connection. Yesterday morning, Jack Posobiec, with his 300,000 followers, was already suggesting a tie based on a link to Ross’ more recent report.